This delightful beverage is a special blend of eight ingredients. Eight Treasures Tea is a great thrist quencher and it has medicinal properties that help to decrease body heat, promote digestion, induce appetite and relieve fatigue. This herbal tea is sold in packs of 10, with each pack weighing around 15 grams. 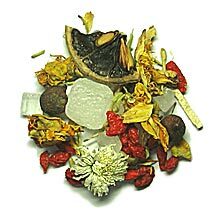 Chrysanthemum, Organic Green Tea, Honeysuckle, Licorice, Red Date, Haw, Dried Tangerine, Rock Sugar.